If pre-kids you were a keen traveller, you will no doubt be mourning the loss of the city break which for many parents no longer seems possible with little ones in tow. Dragging one or more children around museums and along endless streets can be torture for all involved and the joy of a long lunch can become a nightmare when your toddler won’t stay in his chair or insists on tripping up the waiter. However, with a bit of planning and research it is still possible to have that holiday of fascinating culture and good food as well as quality family time. The most important thing is to pick the right destination for you and your children. Venice frequently tops the list of city break destinations but should be avoided if you have a buggy (too many steps) or a toddler (too many canals to fall in) and definitely don’t dress said toddler in a red rain coat but that’s straying from the point. So look for a city which works for your family. Lisbon has an amazing aquarium located next to a large pedestrianised walkway. An afternoon here for youngsters can balance out a morning spent exploring the historical city centre. 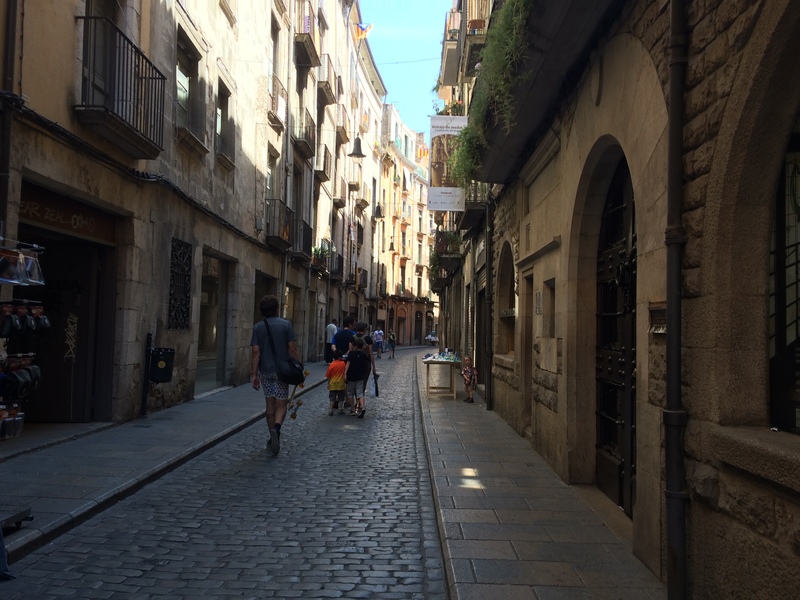 Barcelona is another win-win destination with plenty of car free streets for children to burn off their energy as well as a sandy beach which will more than make up for a few hours of Gaudi explorations. If you’re on a budget and tied to school holidays but you’re desperate for a change of scenery consider looking at some of the low cost carrier bargain destinations. Heading to Berlin for a few days over May half term will slice in half the cost of airfares compared to the obvious family friendly destinations of Palma de Mallorca or Malaga. Of course, the best way to save money is simply to stay in the UK. York, for example, has a multitude of attractions for young children such as the National Railway Museum and the Yorvik Viking Centre while Oxford’s Ashmolean is a wonderfully bright and peaceful alternative to the crowded museums of London. Avoid hotels is my biggest piece of advice and with so many self catering options now available with the advent of Airbandb and its various spin offs, there is no excuse to find yourselves cramped in a small hotel room silently drinking a glass of wine while your little one slumbers in a cot at the end of your bed. Location is also key. A centrally placed apartment is great but can be expensive if you need two bedrooms so if you are visiting a compact city or one with good transport links, consider staying out of the centre in one of the less well known neighbourhoods or suburbs. There are likely to be more local families living there, fewer tourists, cheaper eateries; all adding up to a more authentic holiday experience. If you have particularly energetic young children you might enjoy staying outside the city on a farm which you can retreat to when the children need to let off some steam. Some Italian cities work really well for this concept. I stayed at an agriturismo near Perugia during the Umbria Jazz festival several years ago; it offered very cheap, spacious self catering accommodation as well as a swimming pool and it was just 20 minutes’ drive away from a truly beautiful city with daytime live music filling the streets, it was bliss (and the car parking arrangements were fine too). For many of us, a city break is all about experiencing the destination through long lazy lunches and big dinners plus a few visits to enticing cafes in between. If you are travelling with a stationary baby, he may well oblige you with a two hour lunchtime nap or indeed sleep in his pram while you have your evening meal (neither of mine did the latter but I have heard some enviable success stories). However, if your children are mobile consider a restaurant in a pedestrianised area where they can run around after they’ve had their fill. We’ve managed several relaxing lunches in piazzas and car-free streets this way. If you want to encourage your children to visit a few places of cultural interest, avoid the summer months and possibly even May half term in southern Europe where 30 degrees is not uncommon by then. Pacing the streets of Rome in the scorching sun will hold no appeal to children of any age and you are likely to be as worn out as they are. Go in February or at Easter and balance the sightseeing of, say, Rome’s via del Corso with a thick hot chocolate and a pastry (or ice cream) in fountain-filled Piazza Navona. Family-friendly Copenhagen by contrast is perfect for a summer city break as temperatures are more likely to be in line with those of the UK making it perfect for al fresco lunches in the many pedestrianised streets. Be realistic, don’t expect to tick off too many of the must-sees of your destination. For example, if you’re spending three days in Madrid aim to see just two or three “sights” such as the Plaza Mayor or Gran Via rather than trying to cram in the entire contents of your guide book. A morning in the Prado won’t appeal to most children whereas a smaller gallery such as the Sorolla museum or the Caixa Forum will be a lot more palatable. And if you end up spending a whole day in Madrid’s (wonderful) Retiro Park, consider it well spent family time! Although it’s important not to lose all links to spontaneity, it is a good idea to do a spot of research on child-friendly attractions in your adopted neighbourhood. This might simply be asking your accommodation provider where the nearest playground is or supermarket for stocking up on breakfast provisions and snacks. Alternatively, find a parent forum for your destination and note down one or two child-friendly eateries. If you’re pushed for time, simply tap in “children” and your destination into Google and you’ll find a completely different (and possibly superior) set of attractions to the ones you would have visited pre-kids.